Shipping is free to any destination in the UK for orders with a value of £30 or greater (subject to a max weight of 1.0kg). Orders wilth a value of less than £30, will be charged a fee of £4.00. Any order that weighs more than 1.0kg or that has a delivery address on islands (i.e. not UK mainland) may be liable to additional postage costs. In this instance, we will contact you before processing your order with details of the postage cost. We mainly use the postal service, but also use courier companies (especially for larger items or high value orders) (signature required). We will dispatch your order within 1 working day of receipt of your order, once the item is in stock. If the item you have ordered is not in stock, we will contact you and let you know the expected delivery date. Due to the increasing postal charges we are unable to offer free postage. We will email you with the cost of sending your package prior to despatch and before taking payment from your account. Please note that orders with a value greater than £50 will require a signature and therefore will not be able to be delivered to automated self collection services, such as DHL-packstation. 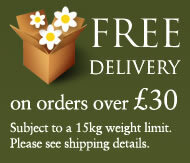 We will email our delivery quote before despatch.